Characteristics: Tempered glass (10mm), use of designated, pre-planned parking area, no bottom guide, no aluminum frames, polycarbonate insulation profiles along panel's full length. Top, bottom and side insulation with brush seals. Basic dimensions: 105mm for upper and lower aluminum profiles, aluminum track size: 60x53mm or 75x72mm..
Salinox’s F2 glazed folding door is a heavy-duty system designed for a wide range of applications. It is ideal for large openings of any kind, from shop fronts to the perimetric enclosure of exposed and unsheltered constructions (i.e. pergolas), basically any large space that will on occasion need partitioning. It can support an unlimited number of panes, each of which can be transferred and parked in a designated remote area - a parking space. Its glazing is 10mm tempered uniform glass boards - bearing no holes or notches, since each of its panes is clamped and held in place with Salinox’s patented method (patent No. 1004694). Each pane is secured and locked with latches and/or floor locks, and can be modified to adapt to any flooring and floor morphology, as well as any other particularity. Any pane can also be turned into an opening/divertible door, used as an entrance once a roof spring mechanism is fitted in. Such entrances can be both single and double winged. Water tightness is achieved by using transparent polycarbonate or aluminum joint-covers between the panes. The upper and lower horizontal profiles bear synthetic insulative brushes which cover the gaps efficiently enough to keep the construction watertight and insulated as well as possible. The F2 folding doors system is an excellent choice for large openings. 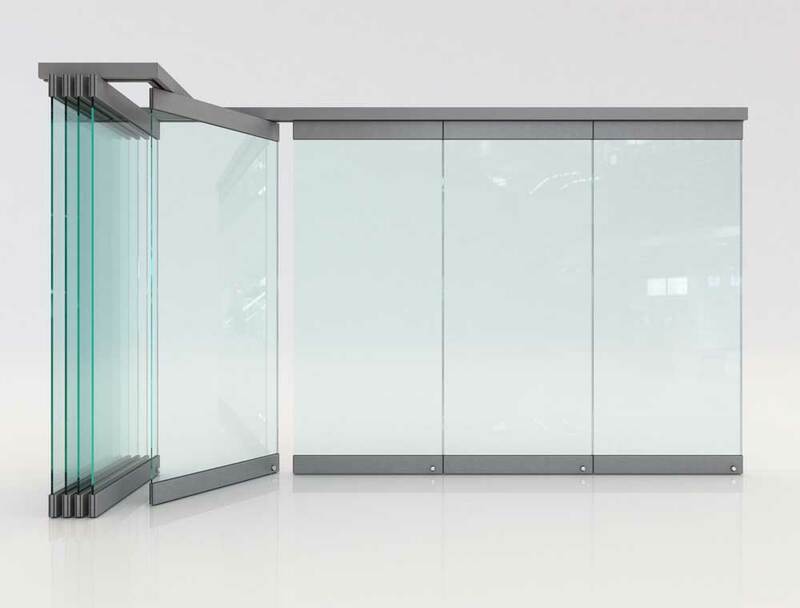 It has a wide variety of usages, including in store front windows, external areas (for example in cafeterias or swimming pools), patio entrances or internal space dividers etc. Essentially, the F2 system can be used in any area which needs occasional isolation. Minimal aesthetics: Elegant and contemporary design. Glass is held together with upper and lower aluminum clamps, thus maximizing the glass surface by avoiding the use of aluminum frames.